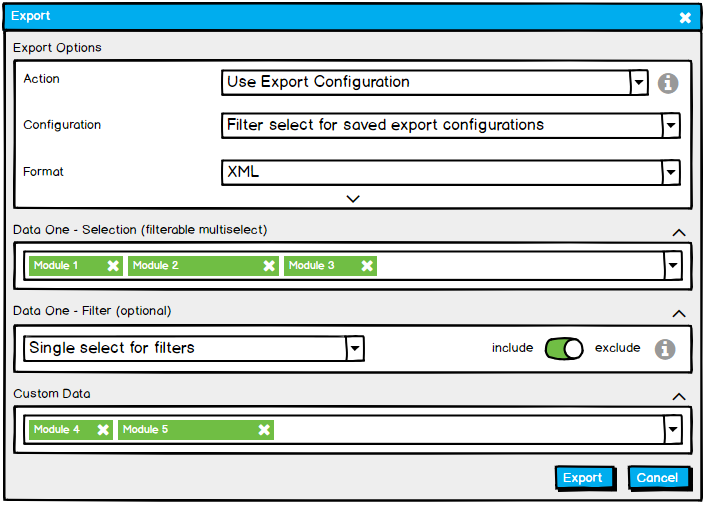 I am designing a new feature and workflow in our business application, which allows administrators to create export configurations, which can later be selected by users, to quickly export projects with a certain configuration. The goal is to let users more quickly and conveniently export their data, so they can use it in other applications. 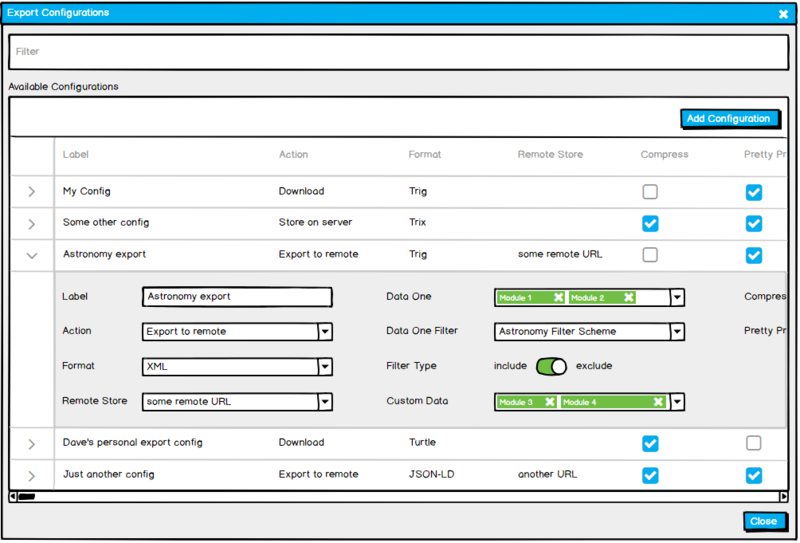 Admins can Add Configurations (as indicated by the top right corner button), which opens the dialog (first image, but replaced export button with save) and lets them save this configuration, which gets added to the table. Subsequent editing could take place in the data table itself, by means of expanding the respective row and changing values in place, without the need of a dialog. In order to cause the least amount of distraction and cognitive load, I opted for the in-table-editing, while still leaving the creation process in a dialog. My reasoning for this is that the process of creation is mentally relatively separated from the context you start out and warrants the use of a dialog. Yet, editing (possibly multiple) configurations later on, while maybe even comparing them, would be severely interrupted by having to open a dialog for every configuration - which would also severely impede the ability to scan and compare while editing. One of my colleagues argues that, to the contrary, the creation and the editing process should take place in the same "established" environment - namely the UI of the dialog - in order to remain consistent and not have two different interfaces displaying the same information. Which procedure is more recommended in order to keep the administrator's effort (both cognitive and manual) the lowest possible and aim for the least friction in the workflow? I agree with your colleague completely. One should use the same view/form for creating/editing a particular type of entity. Having different views for essentially accomplishing the same thing is unnecessary cognitive load in my opinion. Not the answer you're looking for? Browse other questions tagged interaction-design data-tables workflow cognitive-load or ask your own question. How to design a Win 7-like dialog for choosing One of N options without a confirm button? Which tools and methodologies are used in UX desig to build a UI from analytical data? Which is worse--making the user close a file before they can export a second time or having multiple similar files open? “Record in Use By Other User” Guidance: Try Again Later? Or Other Solution? How to structure data intensive view with form fields and master-detail? Data table: inline edit - save/cancel on other action?